The Deburring Cube is easy to use. Simply draw your knife edge lightly through the block after each stone in your sharpening progression to remove any residual burr. Measures 1" x 1". The felt block is a must for sharpening, since Ive tried it I cant do without it. Thank you Chefkives to Go! Wow! Can't believe I made it this far in life without one of these. 20 sharpenings in and I am impressed! Costs almost nothing, invaluable in refining the edge between grits or as a finishing touch. Works very well at removing burr from my knives after running them through my finishing stone. ( I use the 6k Arashiyama ) The only problem I've had so far is that I've lost 2 of em so this is my third time ordering one! Works as advertised, I find it awesome at removing the burr and helping me achieve a super clean edge on my knives. Yes you could strop the burr off on the stone or run it on the edge of block of wood but this simple felt block works perfectly. Try it, and you won�t be disappointed. Works! If you have tried everything to remove a wire edge or just can�t seem to get a knife sharp this will help. Wasn't expecting it to work as well as it does! Definitly worth the money! Product set out to do what it claimed. It was worth the money. This adorable petite tool does what it was intended to do. The deburring block works great. It really gives a final touch to the blade before shaving, extremely smooth! 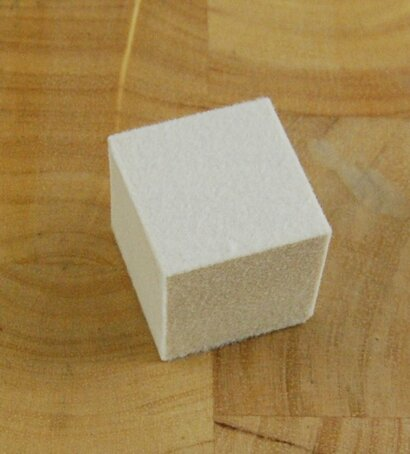 Who would have thought that a cube of solid felt could be so helpful when knife sharpening? This felt block does a great job of removing a stubborn burr, allowing you to get the cleanest, sharpest possible edge. Highly recommended! I'd like to see you offer this product with a magnetic base so it can be attached to the stropping platform. I don't like using it with my hand holding it with a very sharp knife pointing toward it. Does the job, and does it well. I have been known to deburr on many more suspect materials. This one makes me feel like I'm being a little nicer to my knives! I actually think my knives feel sharper after I de-bur them. I love this little thing. If you're like me, and are a bit psychotic obout your blades and love to sharpen, then you need this. It really does make a difference. Fantastic product. Worth every penny and then some. Easy burr removal makes the whole sharpening process slightly faster and more enjoyable. When I got this block a year or so ago I didn't think it was of much use. I was trying to use it on large burrs that are easily removed with the stones. Where this item truely shines I've now found is for very small burrs when the edge is very sharp and a burr may be more difficult to detect. Now that I know how to use this tool I feel it is an essential tool for any sharpening setup. This Hard Felt Deburring Block is excellent,not only for the intended use but also for polishing the blade.Cork is also good for deburring but not easy to find. I would highly recomend this item from Chefknivestogo. Mark and Sue are very nice and helpful and their shipping is FASSSSST. Let me cut it short. I was sceptical at first, but it works and it works better than a cork; especially when it is loaded with 1 Micron Baron Carbide Paste. You can cut into edges to de-burr, or as I figured out you can also de-burr hard-to-go wire edges by rubbing it to your edge with 10-15 degrees angle and do it in sections. Just imagine you are polishing your shoes with a pad. It is that sort of a motion I am talking about. pretty nifty little item and it works. A great buy! I haven't seen any reason to have this. Maybe for very small burrs on softer steel blades. On harder steel blades with s significant burr I see no change after using it. For the price it's worth a try though. Some like it. I'd suggest getting better at removing a burr with the stone you are already using. Handy little tool for deburring. best for removing burr after sharpening. Also great for polishing surfaces to mirror like shine. Great buy, very pleased with product. Works great! Really good deal. Neat little thing to have around if you don't drink wine and save the corks. Removes the burr with ease and since a lot more wine companies are going with synthetic cork now a days (which are to solid for me) nice little alternative.